For interior residential or commercial painting, there exist full-proof ways to ensure impeccable results. Here is a non-exhaustive list of the steps to follow in order to get a finish like those of professional painters. To complete a painting job in an efficient manner, one must first prepare the room. This means, among others: removing the electrical outlets, thermostat panels, and lamps, placing the furniture in the center of the room and covering them with a protective cloth (or even better, put them outside the room), removing the curtains, stores, and doors if needed, etc. Devoting a few minutes to preparing properly your room allows you to increase your productivity and waste less time with edging, avoid paint mess and reduce the final cleaning task. An adequate substrate preparation allows for optimal adhesion of the paint on the surface. In order to do so, it is essential to fill the holes, cracks, and voids on the surface to paint. One must also sand the bumps to try to make it smooth. It is sometimes necessary to clean the surface to ensure adhesion, especially in the case of smoke, grease or mold stains. Before choosing the ideal coating for your interior painting project, you must think about a few points. Does a lot of light come in the room? In which case, you should choose a flat or low-gloss paint. Is it a high-traffic area? If so, you should think about a scrub-resistant paint which has the ability to sustain cleaning and scrubbing without fading. Is the ambient air humid? Think about a mold-resistant coating. Is your origin color deep? Choose a paint with a great hiding power to reduce the number of coats you will need. You are not used to painting? Aim for a paint with easy application. Make sure you also choose the brushes and rollers recommended for the product you want to apply. This way, you can avoid disastrous consequences like lint on your walls (commonly called « orange peel »), brush hairs on your surface and other problems. It is possible to ask for advice in a specialized paint store: however, superstores are generally not really good to help you. Professional painters, on the other hand, know how to do it all, they bring their own paint, equipment, and supplies. You only have to choose the color! For painting a surface that is in good condition, a primer is normally not necessary. If your surface has already been painted, if the previous paint is peeling or if an oil paint has been used, a primer will be necessary. Ask for advice to your local paint store or to an experienced painter. Before picking up your tools, make an inspection to ensure no area was neglected, remove the drippings, sweep the plaster powder if needed and clean the paint drops, if any. Then, replace the sockets, lamps, curtains, doors, and other elements you removed before painting, and finally, place the furniture back in its place. You desire to have the best result possible without stress and in no time for the painting of your residential or commercial building? Stop looking! 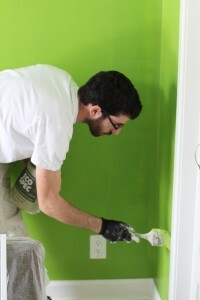 Our team of experienced painters has all the required competencies to guarantee your satisfaction. Contact Dave for a free estimate: 514-966-0966.